Slate Digital has announced a partnership with the makers of the S-Gear virtual guitar amp collection, Scuffham Digital. This week again, MeldaProduction has selected five plugins to be discounted as part of their 2016 Eternal Madness discount. Plugin Alliance's "Plugin of the Month" for January is Brainworx's bx_rockrack Pro, and it is offered at 80% off until the end of the month. Audified has updated its virtual bass amp GK Amp to version 2.2 and released a light edition (LE) version for which you're able to set your own price. Today, Joey Sturgis Tones offers two discounts on IR banks, plus extends yesterday's offer on the Ben Bruce Toneforge amp. Today's flash sale at Joey Sturgis Tone gives you the opportunity to get the Toneforge Ben Bruce virtual amp plugin at half price. As usual, Waves offers three products at discounted prices this Sunday only. Today's door at the Plugin Alliance's Xmas calendar has revealed the Engl E646VS 4-channel virtual guitar amp. 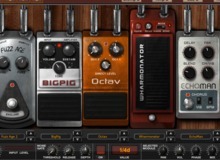 Hornet Plugins has released Guitar Kit, a complete solution for guitar sound including virtual amplifier, cabinet and microphone simulators.